This Thursday, Nov. 18, in the Dirksen Senate Office Building, Room 226, the Senate Judiciary Subcommittee on Human Rights & the Law will hold hearings on U.S. ratification of the Convention on the Elimination of All Forms of Discrimination Against Women (CEDAW). 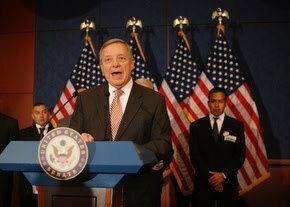 The Committee is chaired by Senator Richard J. Durbin (D-Ill, right). By way of background, the United Nations adopted CEDAW in 1979, and the U.S. played an important role in the drafting of the treaty. President Jimmy Carter signed the treaty on July 17, 1980, and transmitted it to the Senate for consideration in November 1980. The Senate Foreign Relations Committee has twice voted favorably on CEDAW with bipartisan support: in 1994 (with a vote of 13-5) and in 2002 (with a vote of 12-7). Nonetheless, the treaty has never been brought to the Senate floor for a vote. Thursday's event is the first hearing on CEDAW since 2002 and the first such hearing in this particular Committee. Information about the campaign to encourage the U.S. to ratify CEDAW is available here. The ratification record is available here.